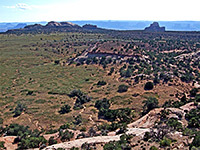 The two highlights of the one mile Aztec Butte Trail are a collection of Anasazi granaries, built in alcoves below the rim of a steep-sided mesa, and the view from the top, which overlooks the middle part of the Island in the Sky, including the deep ravine of upper Trail Canyon to the north. The hike is quite popular, and like the equally short loop to nearby Mesa Arch has an enhanced trailhead with route map and information board. The granaries are quite small but interesting enough, and represent one of the few ancient relics on the generally arid and uninhabited plateau between the Green and Colorado rivers since most settlement was lower down, nearer to reliable water sources. 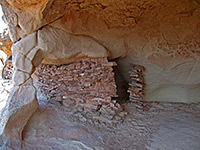 The Anasazi would climb up to the plateau just to collect food, storing it in protected sites such as those along the butte. Map of the Island in the Sky. The path begins 0.7 miles along Upheaval Dome Road, just past the turning for the Willow Flat campground. It descends gently down a sandy slope through bushes and cacti then runs along a dry wash beside a small hill where a side trail forks off, climbs the north end and loops around the top, passing one small granary on the west side. The main route continues towards the base of a larger butte, ascending a little to the edge then climbing much more steeply across the smooth slickrock sides, up 200 feet to the flat top. 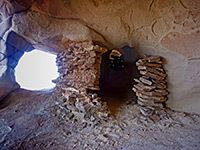 A cairned trail heads clockwise across the plateau and down to a ledge just below the west rim where three granaries are located, built in alcoves and between arches in the white Navajo sandstone. One looks authentic, held together by old adobe, but the others are made just of rocks and look to have been recently reconstructed. The path returns to the mesa top, passes an inconspicuous surface granary and rejoins the entrance route on the south side. The best views are to the north along Trail Canyon though the butte is the highest point for miles around so there are no obstructions in any direction.